Ways for a snake to get in the basement - Basements are one of the most common problem areas for snake infestations. When the ground shifts from frequent thawing and freezing, foundations on builds will shift and crack. These cracks are ideal places for snakes to create dens. 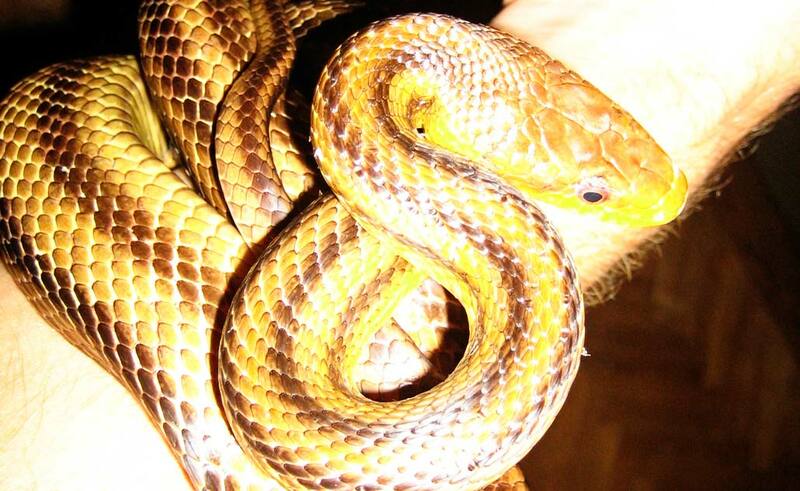 The gaps along your home’s basement are not the only way for these reptiles to get inside. Snakes can maneuver through holes of many different sizes. Common places for them to enter at ground level are through uneven door jams and through damaged window molding. Before you can hope to get rid of any snakes inside your home, you will need to patch all the openings that might allow them inside the building. Snakes are not as industrious as other nuisance animals, and will not chew through sealants and other blockades. You can, of course, eliminate the issue of snakes being close to your home just by keeping your trim cut to a low level. There is nothing a snake likes more than long grass to hide in along a foundation. If you can keep the grass short, and keep gardens away from the home, snakes will have no cover to shield themselves from predators or the elements. How to get a snake out from under your house - Getting a snake out from under your house is not always a necessity. Remember that snakes do not do any physical harm to the home; they simply live in an existing crack. Unless the serpent has made its way to the interior of the building, consider letting it stay. Snakes keep away rodents and eat insects. Letting a rat into your home will be far more problematic than allowing the snake to stay. If you must have the animal gone, first see if you can identify it. As long as it is a nonvenomous snake you can feel free to try to trap it and relocate it yourself. Trapping can be done with a glue trap that allows you to release the animal by deactivating the glue with cooking oil. A venomous snake should never be handled by a homeowner. The vast majority of bite cases from venomous snakes happen when someone was trying to handle or kill a venomous snake. Don’t think about taking a garden hoe to the creature. The reach of the garden hoe is shorter than the striking distance of the snake. All venomous snakes should be removed by a professional. If you’re willing to wait a few days, chances are the snake will move on if it is venomous. How to get a snake out from under a building or shed - Many sheds are now bought at garden centers and delivered to a home all in one piece. To prevent the floor from rotting, the building is set up on some kind of support system that allows air to get under the wood. Most homeowners never close off this opening under the shed. Snakes love these areas because they are full of cool dirt and insects. If you’re not careful, snakes won’t be the only nuisance animal that will take a liking to your shed. The best thing you can do to get a snake out from under the shed is to close off the area, leaving a small gap. This single opening will be where the snake is forced to go to access the outside. Place a snake trap near the opening. Glue traps are excellent for trapping snakes. The captured animals can be taken to a relocation area and then released using cooking oil spray. If you don’t want to spend the time trapping the snake, you can hire a professional to come and remove the snake from the shed. Their tactics will be more direct, and more efficient. Remember that the snake will want to come out to sun itself eventually. If you don’t want to trap the animal, you can place a flat rock near the shed and pick the snake up with your hands. Of course, venomous snakes should never be handled. 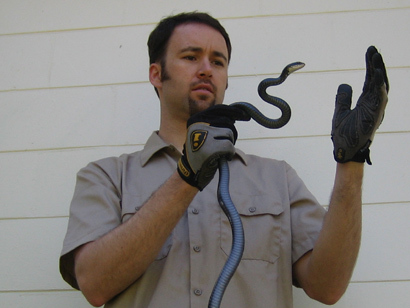 Go back to the main Snake Removal page for more information about snakes in the basement or under a house. How to keep snakes out of your basement: If there is a snake problem in your area, there are some steps that you can take so as to keep them off your property. If you want to keep the snakes from your basement, then it is necessary to make sure that the property isn’t attractive to them. Snakes don’t get into your basement with the aim of making your life harder or to terrorize you. The snake may be only seeking a place which is safe so as to shelter and rest especially when there is inclement weather. It is also possible for the animal to track prey up to your home and finally into the basement where animals like rats love to stay. By the snake standards, ending up in your basement is totally legit but most of us would rather that the snake be anywhere else but in our homes. You need to eliminate all the possible hiding places that the animals may be using within the property. This can be done by having the best yard keeping practices. Snakes are actually very stealthy hunters and they require a sufficient cover so as to be able to ambush their prey in a successful manner. You need to relocate things like the compost piles away from where you dwell and keep your lawn short at all times. If you have shrubs and hedges, it is important that you trim the low limbs so as to be around 12 inches from the ground. If you have gardens, make sure that you weed them thoroughly and as often as needed so as to avoid having any kind of cover. You also need to dispose all plant refuse. You also need to move the brick piles, metal sheets, boards and even firewood to be far from your residence as you possibly can. The materials need to be stacked to about 12 inches from the ground. Make sure all debris and refuse is removed from the yard immediately and make sure that there isn’t any clutter lying around the compound unnecessarily. You need to eliminate all kinds of animals that attract snakes to a hunt. They feed mostly on frogs, lizards, birds and rodents. There are some insectivorous snakes too. When you have a snake within the basement, it may be an indication that there is a rodent infestation. You have to move the bird feeders to be as far away from your house as possible. If the snake can’t find available prey, it will leave.